American Apparel tank, Cameo the Label patchwork denim shirt, Grey jeans c/o Maurices, For Love + Lemons Love You Knot bralette, Shoemint clutch, Lorika booties c/o Shoedazzle. Shot by Isaac Lacey. Earlier this month, Refinery 29 reached out to me to see if I'd be open to trying out a new pair of jeans from Maurices. With Fall around the corner, I figured I'd have to give in to the idea of wearing pants again at some point... so I happily accepted, then headed online to check out their site and was blown away at how affordable everything was. I mean, $29 pairs of jeans?! What is $29 anymore? I ultimately chose the light grey jeans above because I don't have anything like them in my closet. I was a bit skeptical at first because they are listed as 'jeggings' and I have a really strong aversion to that word, but I wound up really loving them! Although they have the appearance of 'real' slim jeans, they are super soft and easy to slip on - almost a hybrid between a pair of sweatpants and your fave pair of pants. Here I paired them with some funky blue suede booties to add a little edge to the look, but I could see them being equally perfect for travel, or any time when you want to be comfy but still look put together. And for $29? They're definitely worth giving a shot. Disclosure: Compensation for this post was provided by Maurices via Refinery 29. The opinions expressed herein are those of the author and are not indicative of the opinions or positions of Maurices. ....and let's take a moment for those blue open boots! stuff like that can make one almost not regret the summer is over! love love your hair and style! You wear these jeggings well! I find that jeggings are sometimes more comfortable than jeans. Great outfit and have a great weekend...Yippee! I love these shoes! Amazing photos xo Really great outfit! 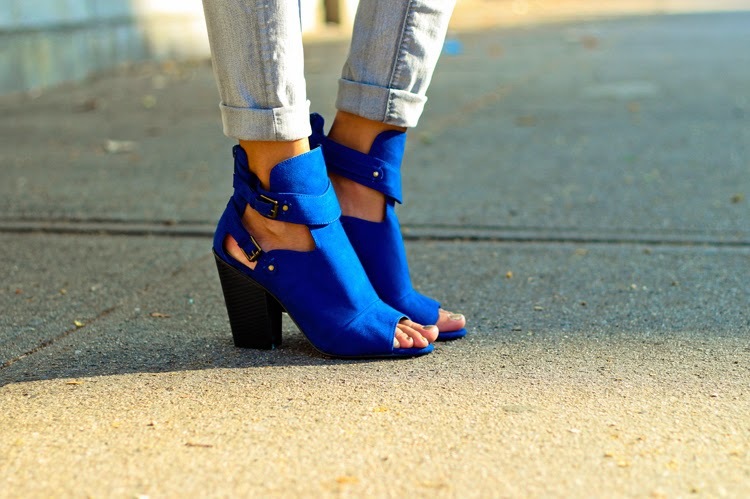 Blue shoes - you got me there, these are divine! Love your shoes and hags, they are so cool! They are perfect on you! We love your photos, as usually.. The look is so cool!! Love your blog! I am so happy you found mine so I could read yours. :) Newest follower. She is looking awesome with that blue shoes.My wife liked this and demanded something like this to me. She is a fan of blue color also.